Not knowing much about adoption I always assumed that a childless couple who wanted a child, got an agency, took the first child who came up for adoption and that was it. But recently I’ve gotten to know several young mothers with adopted children. One in particular described so eloquently, that it wasn’t just any child God gave her a longing for. It was a specific child, in this case, a boy. She didn’t know his name or if he was even conceived. All she knew was that God had a specific son for her to adopt. This past fall that precious boy was placed into her arms, into their family’s life, and into their hearts after 4 years of waiting, of praying, of believing. 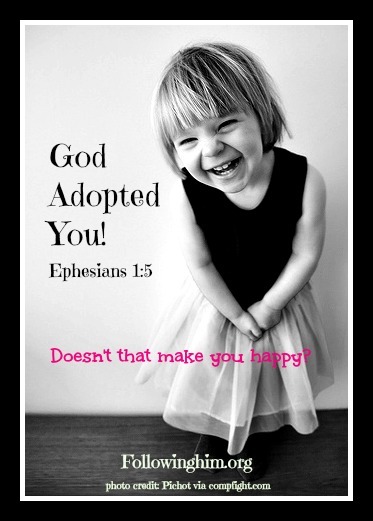 Perfect in every way, good in every way, powerful in every way, God chose and predestined that you, specifically, would be His beloved daughter through adoption because of His kind intentions toward you! My daughter and her husband have two precious children, Emma almost 9 and Evan 4. They had prayed so earnestly for Emma and Evan and their conception was not easy, but their prayers were answered and their family was complete. Or so they thought! God had other plans. Jennifer at age 37 gave birth to baby Owen at then end of January. We were all so thrilled, but the truth is he was an unplanned pregnancy. He is loved, most definitely, but this time last year, he was not on anyone’s radar…except God’s. Unlike pregnancy, there are no “oops” babies with adoption! Never was there an “unplanned” adoption, much the opposite in fact. There are usually years of praying, years of planning, years of yearning. Your parents may have told you that you were an accident or unwanted. You may not even know who your father is. You may have never felt loved. Or perhaps you were adopted but have felt a longing to know “the story” behind your birth. I will tell each of you the story behind your birth… Your Father, Your Creator, God Almighty, designed you and created you to be His very own. He may have even overridden the desires of your birth parents to make sure you were conceived and born. Because He loves you, wants you, yearns for you to be His daughter. He has built all of eternity around being with you, specifically you. You fit into His plan and into His heart. He wanted you so badly that He allowed His only Son, His perfect Son, to die for you, just so that you could spend eternity with Him, not as a slave, but as a treasured daughter. In Matthew 13:46 Jesus uses a parable to describe a man finding a pearl of great price in a field and seeing its worth he sold all He had to purchase the field. You. Are. That. Pearl. Of. Great. Price. Oh dearest one, you are one of kind. You are surely God’s kind of daughter and He moved heaven and earth to make sure He could purchase you for adoption through Jesus’ shed blood. My friend recently had a party to reveal their adopted son to friends and family. Their joy was unequaled. Girl, God has a “revealing” party planned to show you off too! It is so big that “creation” longs to see just who you are; just who God adopted. Oh my goodness, I cannot wrap my head around that frankly. Embrace your status. You are adopted. You are His daughter. Now live like it! Throw your head back and laugh out loud if you want to. Your adoption into the family of God is an amazing story, eons in the making! Lord, oh Lord, it is hard to digest such amazing truth. You personally, specifically, literally chose me to be Your very own daughter through adoption. I scarce can take it in. Lord, help me to be a good daughter and let me start by believing, by remembering every day, that You adopted me, because You loved me and have kind intentions towards me. Oh Lord, You are a good Father. Thank You for making me Yours. Hello, God? Can you hear me now? What to do when you have fallen off the diet? Or fallen the off the wagon? Is Quitting your only option?